Syntrinsic » America » Whose Debt Is It Anyway? In the depths of World War II, when the course of battle was looking most bleak, American forces went on an unusual offensive. War heroes like Medal of Honor Marine Sergeant John Basilone joined actors and singers in grand tours of the United States to host War Bond Rallies. Their goal: to persuade the American public to buy US Government bonds to provide the country with the short-term financial resources necessary to arm the largest and best armed military force the world had yet seen. And it worked—ordinary citizens stepped up, just as they did when contributing old steel pots and nylons or accepting rations of butter and eggs. Essentially, Americans financed the build out of our military and civilian industry. It is no coincidence that such a massive stimulus helped speed the beginning of the end of the Great Depression. Fast forward to 2008-2010. In the midst of our modern economic crisis, US leaders from President George Bush to Secretary of State Hilary Clinton, Treasury Secretary Timothy Geithner to President Barack Obama, have repeatedly—and humbly—gone to Chinese leaders requesting that they continue to buy US Treasuries. 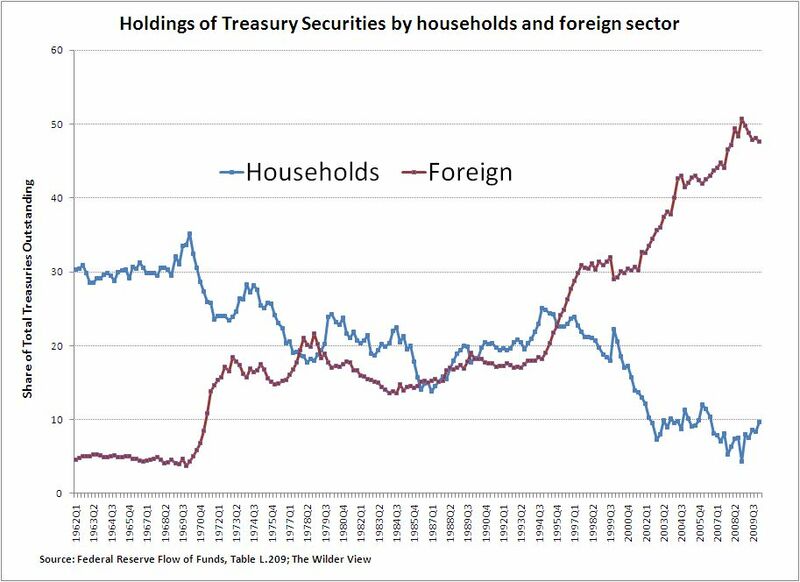 Such an effort makes some sense given that about 28% of the US Treasuries are owned by foreign governments or sovereign wealth funds. Of that 28%, approximately, 31% is owned by the People’s Republic of China, Hong Kong, and Taiwan. Thus on the whole, China, Hong Kong, and Taiwan hold about 9% of the outstanding US Treasury debt, or roughly $1.14 Trillion as of May 31, 2010 (all data from the US Treasury). This rise in foreign ownership is concurrent with a decline in private ownership of US debt. US private households directly hold well less than 10% of the US Treasury debt. We can complain all day long about our growing dependence on China, but nothing keeps Americans from using personal savings to help finance our own spending. If the $1.14 Trillion of US debt owned by China, Taiwan and Hong Kong were divided by the roughly 100 million US households, each household would need to pick up about $14,000 to absorb 100% of Chinese-related lending. 1. Why isn’t there a vocal movement among America’s political and social leaders calling for American citizens to lend money to our government to help finance the departments, benefits, and policies that our Congress has adopted? 2. If you were leading such a movement, how would you persuade ordinary Americans to invest more substantially in US Treasury bonds? 3. If such a movement were to emerge, would American households respond in the positive? That is, would individual Americans be willing to increase lending to the US Treasury? 4. Is there a legitimate concern in having China, OPEC ($235 billion), Russia ($126 Billion) or others with contrasting social or political values serve as major lenders to the United States? Are there compelling reasons to encourage such nations to serve as our major lenders? 5. Assuming that the US continues to increase its reliance on foreign lenders and reduce its dependence on domestic households, how does that impact the US ten years from now? Twenty? Fifty? 6. How would you feel if the Congress mandated that US citizens hold a certain percentage of their net worth (brokerage accounts, 401k, IRA accounts, 529 accounts, trusts, foundations, etc.) in US Treasury bonds? Would that be an appropriate way to help finance US government obligations? The world has shifted a great deal since the war bond rallies of 1942-45, and perhaps we fancy ourselves too sophisticated to get swept up in a patriotic fervor to loan money to our government. However, one could argue that if we truly believe in the current fiscal stimulus, in universal health care and social security entitlements, in a strong military and financial presence in Afghanistan, Iraq, Western Europe, Korea, the Middle East and Africa, education reform, and in addressing AIDS, hunger, and human rights throughout the world, then we should be willing to finance such activities directly rather than relying upon outside lenders. And if we are not willing to finance these policies ourselves, then perhaps we need to engage in more difficult discussions about how we allocate America’s financial resources, about what REALLY matters to us? We look forward to the fantasy concert at Red Rocks Amphitheater here in Colorado co-hosted by Barbara Streisand and her ideological antagonist Kid Rock, where they sing “America the Beautiful” a capella, then ask their screaming fans to help pay for the financial cost of American freedom and ideals. See you there.